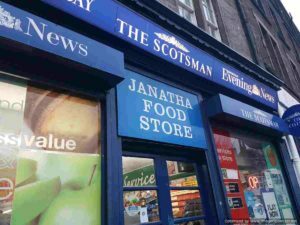 I’m not really one for snacking or newspapers so I rarely find myself in newsagent shops, but in the early days of coronation chicken quest I popped into Janatha Food Store on Montrose Terrace to check out their wares. 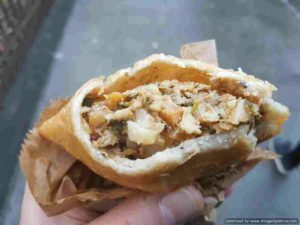 The coronation chicken didn’t rate too highly but I did notice pretty decent looking samosas so made a note to revisit at some stage. When I needed a quick bite on the go early one recent morning, I popped in for a slightly unconventional breakfast. The place is a regular counter and aisles shop. It’s not much to look at and is a little worn at the edges. My eyes were straight on the samosa prize. I decided to go for two of their three options with chicken eschewed in favour of lamb and veggie. With items paid for and a friendly word or two exchanged with the counter man I was on my way, munching as I walked. I started with the lamb one which was packed with peas and potato and a good amount of minced lamb. It was a decent and warmly spiced eat. The veggie one, which was strong on lentils, was a little better. Again the seasoning was on point. So overall, I rather enjoyed the samosas from Janatha Food Store. They were an unfussy if slightly strange way to start the day. I can see these becoming a fairly regular morning option as I like variety in how I start the day and the shop is very handy for my morning route.